Phlizon Newest 600W Review - Should You Buy This In 2019? Is the Phlizon 600w LED grow light a good grow light? The Phlizon 600w LED grow light is one of many 600w grow light models. This brand and model has particularly good customer feedback, and so we wrote a detailed review to help you determine the Phlizon 600w is the best LED grow light for your grow space. I’ll cover all the essential factors you need to consider when buying an LED grow light. If you don’t end up liking what the Phlizon 600w grow light has to offer, that’s okay because I’ve also reviewed a ton of other suitable LED grow lights on our home page and you’re bound to find a good match over there. What are the essential factors you need to know when buying a grow light? I intend to discuss LED type, PAR reading, grow space coverage, power usage, warranty, and more. So let’s get at the Phlizon Newest 600W LED Grow Light. I’ve included ratings of some real product owners, competitor comparison, and feature overview. Phlizon appears to be an established manufacturer of LED grow lights and associated products. “phlizon” Phlizon also makes a high output COB LED grow light series. If you’re unfamiliar with COB LED grow lights, you can read more about them here. Also, at the end of this review, we’ve curated some answers to the frequently asked questions regarding Phlizon newest 600 Watt LED Grow Light. So folks! Let’s begin it then. 1.1.5 Power Efficiency – How Much Will It Save In Longer Run? “Phlizon” the name may look strange or new to some because of some well known and majorly discussed brands. 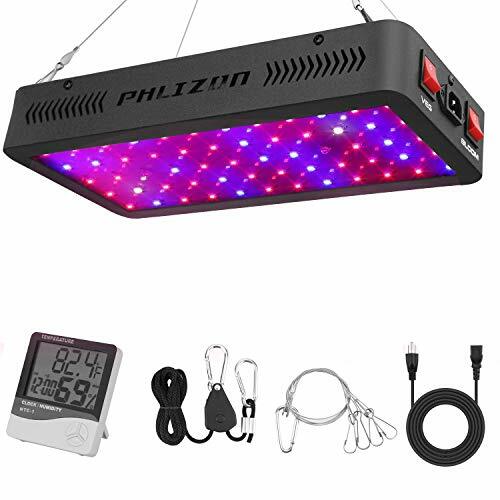 However, we noticed Phlizon has gotten tremendous attention and some real praise for the level of quality Phlizon grow lights offers to their customers. Yeah, the brand is backed with a huge R&D team which is the reason they’ve succeeded in creating a complete light packages for indoor growing hobbyists. Also, their lights are tested thoroughly by some highly experienced and real-life growers in their testing team. Also, if we look at reviews about this grow light over the internet, you’d derive that it’s a solid grow light, especially for the low entry price. The Phlizon Newest 600w LED grow light has garnered a high review rating at the time of writing. 82% of reviewers have rated this grow light in the top 20 percentile and had generally positive things to say. What are people saying more specifically? We can’t directly quote reviews but you’re free to read them yourself here. We can say that a majority of verified owners report positive experiences. Of course there were minor complaints like the fact the delivery box was labeled with the product name. But it’s far from a major issue. Now, let’s dive deep into its capability and performance oriented features. For this review, we’ll start with build and design at first, and then we’ll move forward to other essential aspects like spectrum, efficiency, effectiveness and so on. As we stated earlier, it is one of the most demanded and highly praised grow lights on the market. According to our experts, one of the major reason behind this level of demand and success on this highly competitive market could be its quality and sturdiness. The Phlizon Newest 600W LED Grow Light is built using some of the top-notch materials. A highly experienced R&D team’s hard work is behind its build. As far as core materials are concerned, they’ve used Epistar/Bridgelux LED chips on the panel. These two brands are considered as two of the most recommended brands for a high-quality light. Also, the inner build is supported by highly reliable drivers and Zener diode. If any single LED stops working, the rest of the LEDs are unaffected. Two separate switches for two different stages of plant’s growth are there to offer you comfort while using it. 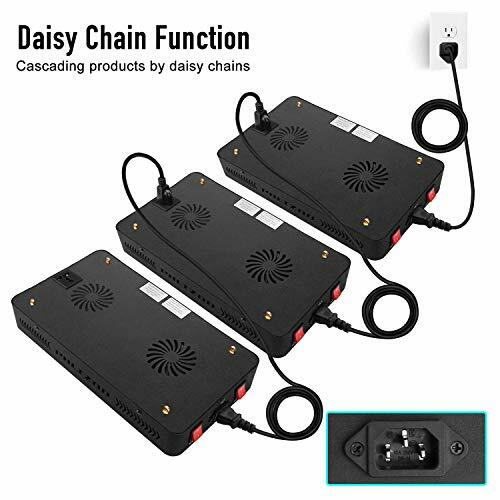 Also, on the backside of the LED Panel daisy chaining port or power outlet is available which means you’re free to extend your grow space whenever you like. The best part of Phlizon Newest 600W LED’s design is, it doesn’t feature any reflector which helps in decreasing light wastage and in improving the penetration rate for your plants. All in all, for build and design we don’t think there is anything to doubt on. 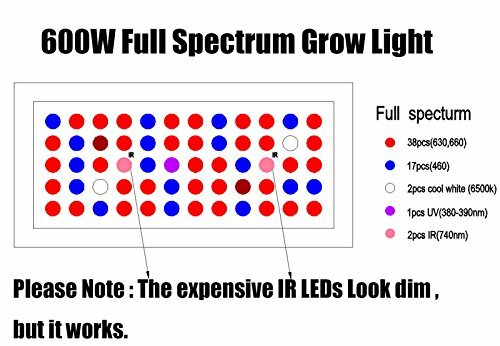 Light spectrum quality is one of the most important aspects to consider while comparing the best 600W LED grow lights. Light spectrum is the critical factor responsible for how well your plants grow based on light penetration and color range. Also, spectrum quality is the only part that matters in the overall outcome expectancy. Moreover, you might be aware the fact that the only reason to utilize LED Grow Lights in indoor growing and cultivation is to replace the sunlight which plays a vital role for any plant’s survival and health. Now, if we talk about spectral abilities of Phlizon Newest 600W, then it is a complete full spectrum LED Grow Light. It seems like they’ve succeeded in mimicking real sunlight up to a remarkable extent. The ratio of important bands like Blue and Red is balanced in a way that your plants get what they crave for. Also, the addition of expensive LEDs for IR and UV bands is a plus point. If you don’t know, IR and UV act as immunity booster for plant’s health and growth while Blue boosts the growth of plants while in vegetation and Red boosts flowering process. Also, Red is responsible for resin formation in flowers which helps in producing heavyweight flowers at the time of harvesting. Moreover, the shade of light while working is pinkish which justifies the higher level of red bands in Phlizon Newest 600W Plant LED Grow Light. So yeah, for spectrum its thumbs up from our side. If you’ve noticed then the majority of brands are specifying HPS/MH replacement figures as if its something that one should worry about the most. However, the fact is those are rubbish figures used to trap customers and nothing else. Yeah, it’s the PAR results that you should consider as a measure of quality and not the replacement figures. 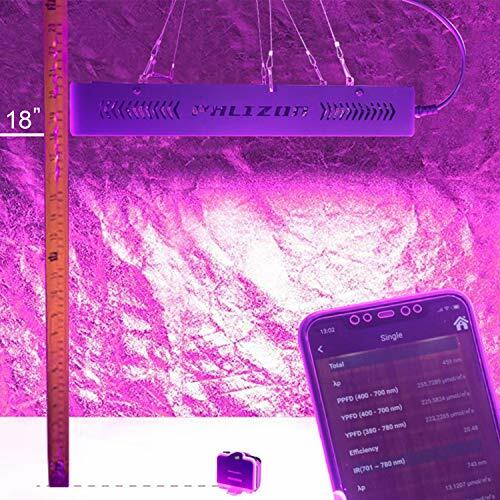 The Phlizon newest 600W Grow Light is capable of providing 350 uMol from the height of 18”. That’ll provide you up to 3ft of well covered grow space. Also, these results are confirmed by real-life users who’re using it happily. I actually read a review where a lady was pleased with this grow light’s results in her 5×5 grow space. But again – every situation is a bit unique. 3 feet of coverage is what Phlizon guides for. If you want to put your money on a product with slightly better PAR results, then Viparspectra V600 Series or MARS HYDRO Reflector 720W Led Grow Light would be the best bet for you. However, both of those models are advanced compared to Phlizon newest 600W and might cost you a bit more up front. In the long run they’ll help you yield more by providing more absorbable light to your plants. Here it ends your wait for coverage capabilities by Phlizon newest 600W Grow Light. Yeah, according to our experts it’s the point which bothers almost every indoor buyer. In fact, one should worry about it too. Now, as far as this Phlizon Newest 600W Plant LED Grow Light Review is concerned, we’d like to tell you that for confirmation its coverage capabilities we’d conducted a survey where people shared their opinions with us. Also, according to our observation, the majority of people said that it is a perfect fit for an area of 2’X2’ from the height of 18”. However, it could be adjusted according to your preference and observation of your plant’s health. People also shared that keeping the light at 22” during vegetation produces the best results for them. Also, from that height, you’ll be able to get a decent footprint for around 2.5’X2.5’ of grow space. Best LED Grow Light for a 4′ X 4′ Grow Tent. Reviews of Top 10+ Best COB LED Grow Light On The Market. Power Efficiency – How Much Will It Save In Longer Run? As we often state, instead of the initial budget focus on power saving so that you can reduce your overall production cost. Well, in that case the Phlizon Newest 600w LED grow light passed our tests by providing some remarkable results. It consumes just 108W while working which is quite efficient. On the other hand, our earlier recommendation of Viparspectra and Mars Hydro consumes more than this one. So yeah, If you’re willing to compromise a bit on PAR Results, then it is the best choice from power saving point of view. A grow light with all positive features and just a single compromise on cooling capability is a complete waste according to experts. Yeah, an LED grow light with the compromised cooling feature is enough to spoil your entire outcome overnight. However, in the case of Phlizon you might not worry as it’s backed with 2 high quality and remarkably silent cooling fans for better heat dissipation and air circulation. Also, advanced and scientifically designed aluminium sink is there to dissipate heat from the grow light. If your grow tent is featuring a ventilation duct, then it’ll be the best combination with that. Also, if you ever feel doubtful about the efficiency of the cooling fans within 2 years, then you can contact their support immediately, and they’ll provide you a replacement. As it’s a 600W Grow light, many might think that it’ll be one of those high priced light on the market. However, the fact is this grow light is priced competitively among 600w grow light options. There is a low reported damage or failure rate with this product. Moreover, even with lowest failure and damage rates Phlison offers a 2 year warranty to their customers. That plus a 30 day money back guarantee where you can ask for a refund, and they’ll provide it without asking a single question. Now, as we’ve covered all features in this Phlizon Newest 600W LED Grow Light Review, we think it is right time to look at its bright and dark sides. Yeah, so that it can help you further in your decision-making process. Also, don’t forget to look at these results obtained using a Phlizon Newest 600w LED Grow Light. Best Budget LED Grow Lights for Beginners. We hope you’ve got a rough idea about its overall value. However, in case you’re still confused then now we’re going to cover some frequently asked questions about Phlizon 600W LED Grow Light. So yeah, in this part you’ll definitely get an answer to your question. Here we’ve tried to answer some frequently asked questions about Phlizon newest 600W Grow Light. If Budget isn’t an issue then would you suggest this grow light? Ans:- Our answer is both YES and NO. Yeah, YES Because even if you’re not bound by budget, but it’s going to be your first small cannabis grow, then we’ll suggest you this grow light as it’s a decent starter light. Also, NO because in case you’re not bound by budget but expecting some better quality then Mars Hydro 720W variant and Viparspectra V600 variant both are better than phlizon 600W Grow Light. Why some LEDs are not working while light is ON? Answer: Before answering your question, we’d suggest you wear safety glasses while looking at this grow light while working. Now, let’s come to the point, it could be because of the inclusion of IR and UV which will act as non-functioning LEDs and will spread infrared and ultraviolet elements on the plants. It’s natural and you shouldn’t worry about it. I’m planning to grow in 3’X3’ grow space, is it suitable for that space? Answer: For a larger area, we’d suggest a higher variant in the same series which is Phlizon Newest 900W. Yeah, that too in case you’re beginning in the growing. However, looking at the price, we’d also suggest you compare other aspects of the 900W model with Viparspectra 600W LED or Mars Hydro 720W and make your decision wisely. Why IR and UV are required? Is it so important to have? Answer: As we stated initially in this Phlizon 600W Review, our ultimate aim is to replace sunlight for our plants to get better outcomes. As sunlight includes UV and IR in it, it is good to have it in our artificial lights as well. So yeah, it’s not mandatory, but it provides an added advantage for sure. For Power Efficiency’s point of view, what should I keep in mind? Answer: A light costing 50$ upfront and sucking 200W for functioning is worse compared to a light costing 200$ upfront and utilising mere 100W for operation. So yeah, in case you’re getting light at a higher cost but with low consumption than 108W and you’re sure about it then go for that grow light. Should I consider some sort of certification on parts as a concern or an important aspect? Answer: As it is an electrical appliance, there is some standard to be maintained. On the other hand, almost all brands have their parts certified by some official organisation, but some advertise it as something that is not so common and traps the customers. Yeah, standard mentioning is just a bait used to convert their advertisement audience into a buyer’s so we won’t suggest you to consider that as something too important. However, Parts used in Phlizon 600W like Switches and drivers are certified by UL, CE and ROHS. Still, we’ve not mentioned it in our reviews or feature part because we don’t think it matters too much. That’s all folks for Phlizon Newest 600W Plant LED Grow Light Review. However, we thought to help you in your decision making by a few words for a closer. 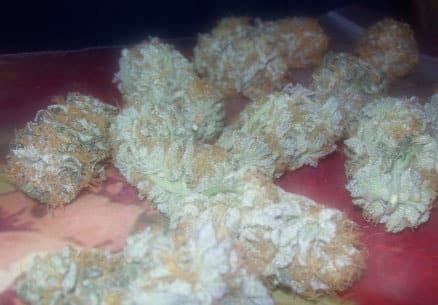 As you might have observed, it was an utterly non-biased review, where we’ve clearly stated about things that could be got in a different grow light. 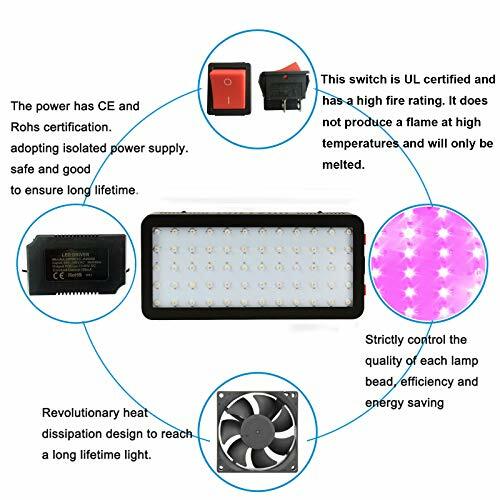 However, our expert’s opinion is to go for Phlizon Newest 600W Plant LED Grow Light in case you’re a beginner or running short on budget or have optimal coverage expectancy. Yeah, based on the fact that there are better options available in the 600W LED Grow Light segment only we’d only recommend it based on above 3 parameters.